Public art offers an interesting, unique and fun way to learn about an area's history, quirks or local flora and fauna. Many big cities around the world show off their artists talents with decorated sculpture forms such as trams and fish in New Orleans, La., bulls in Sydney, Australia or murals in London, England. And now smaller towns and regions are realizing the benefits – beautification and economic – of public art. The popular holiday destination peninsular, Delmarva, home to Delaware, Maryland and Virginia has an intriguing trail of public art, much of it revolving around the water and the life it sustains. Follow the art (working from north to south), find hidden gems, stay in quaint B&B's or boutique inns and absorb some fascinating history through art. The Art Gallery at the University of Maryland and artist Bill Dunlap launched a Poetry & Art in Rural Maryland Project in 2010. 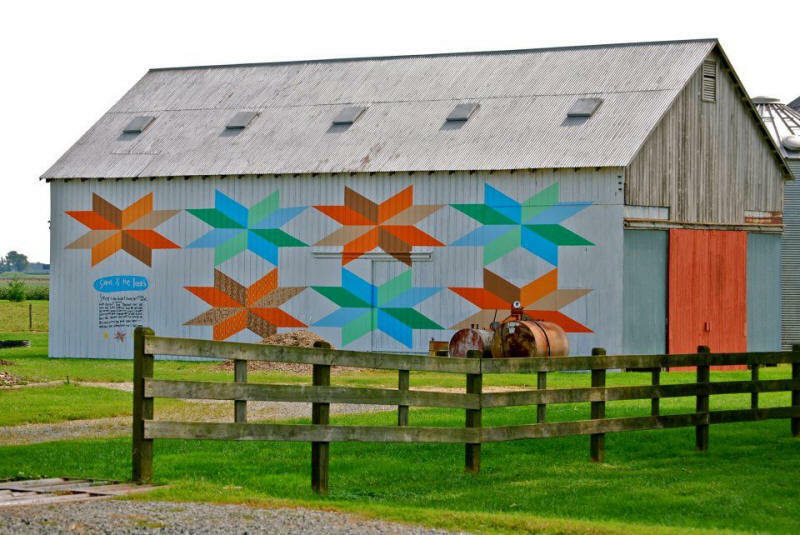 The venture features poetry-based murals on rural structures throughout the state. Once the project is completed they will establish a driving tour to encourage visitors to travel to more out-of-the-way places with the lure of art and poetry. 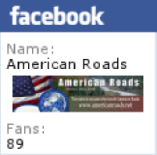 It is as much an adventure of rural driving through rolling bucolic countryside as it is art appreciation. Tucked in among creeks and nooks of the Northern section of the peninsular is Rock Hall, MD. Where the recent Clam House restoration project is a fine example of public art raising awareness to local history and giving a nod to modern changes. Formerly a seafood processing plant, once derelict but now fixed up to host a number of revitalization efforts focused on marine related businesses and boasting an entire wall mural by artist, Ken Castelli. Castelli's design mirrors his model boat building skills. 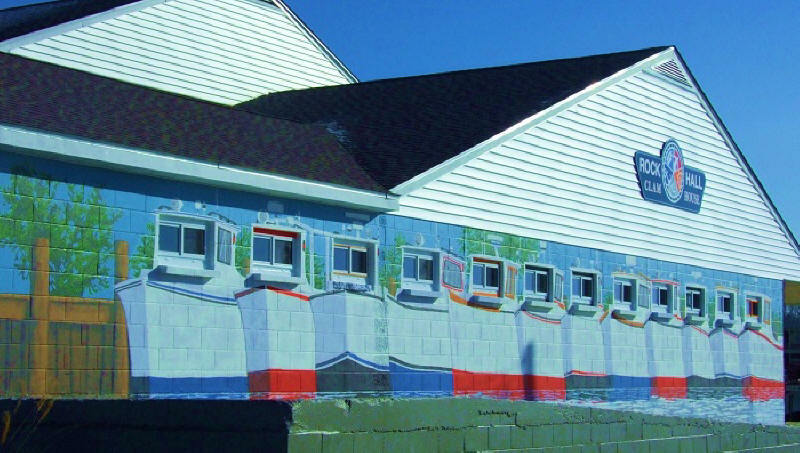 Utilizing simple imagery, he incorporated the existing windows on the side of the building to paint images of work boats jostling beside each other very effectively. "The mural is an exciting work of art and a major asset to the community," Mark Einstein, Chairman of the Waterfront-Watermen Committee said. "The clever design and color scheme adds a welcomed spark to both the building and the harbor. " Further South in Caroline County around the towns of Denton and Easton a new collaborative public art project called Stitching Stories of Freedom: A Byway Quilt Trail Honoring the Underground Railroad is taking shape. Sixteen quilt block replicas have been installed along significant sites of the Harriet Tubman Underground Railroad Byway in Caroline County. A companion trail guide will soon be available to visitors to show them the location of each block, the block stories, and parking locations for each site. 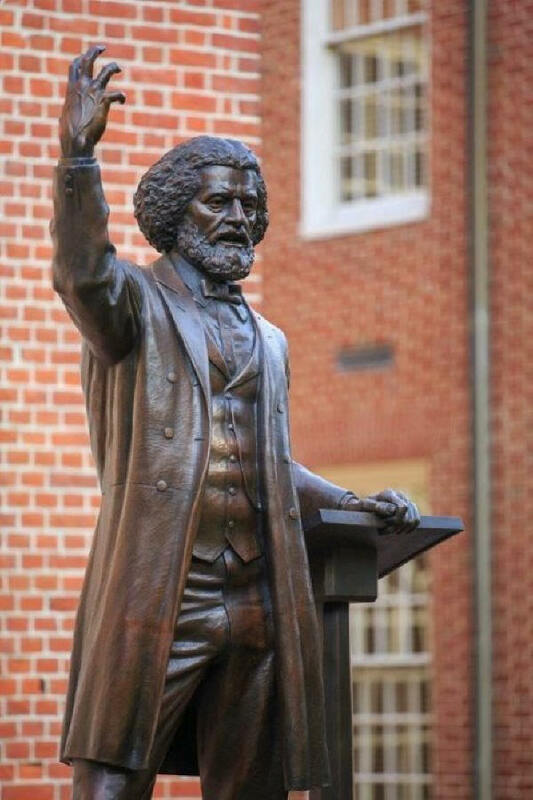 Talbot County, Maryland also is the birthplace of Frederick Douglas and they honor their native son with a fine art sculpture by Jay Hall Carpenter on the Talbot County Courthouse lawn in Easton. Another source of pride is a sculpture called "Family Affair" by Bart Walter, this nod to nature depicting a family of geese stands in front of the Waterfowl Festival Building. A good base to explore Delmarva is the town of Milford in Delaware. Check in to The Towers, a historic Victorian home now a B&B right in the center of town within easy walking distance of a number of restaurants and upmarket boutiques, art galleries, studios, theatre and more. The Milford Library in the center of town boasts a full wall mural of the town by the late Jack Lewis, a prominent Delaware artist. Around the corner from the library the local Mispillion Art League members painted 6 large wall murals showing the towns varied history. Milford mural by Mispillion Art League. Full length from Eastern Side. 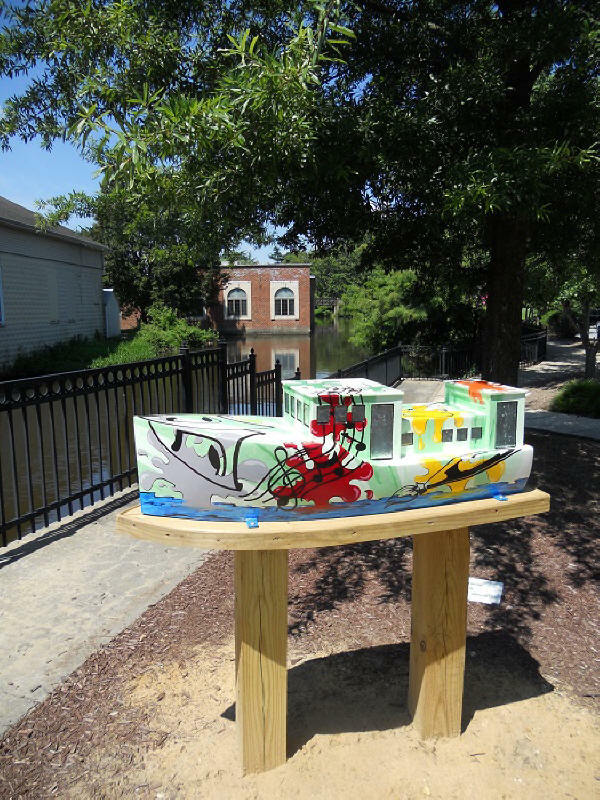 Downtown Milford Inc., (DMI) recently introduced Art on the Riverwalk Tour (ART), a 3-year project placing boat sculptures along their 3-mile Riverwalk . Milford's ship building history inspired Lee Nelson, DMI's Executive Director, to use the classic yacht Augusta, as a model. The Augusta was built in Milford in 1927 of native white cedar. She was the first of the luxury yacht line produced by the Vinyard Shipbuilding Co. In 2010, Augusta was restored,and put back into service at the yard that built her 83 years ago by present owners, Sudler and Joan Lofland. Today, Augusta and the Vinyard Shipbuilding Co. is Delaware's only remaining shipbuilding site of the original seven. They reflect the shipbuilding history and the talented Milford craftsmen who worked here. depictng ship building history & bird life on the river. "The ART project is the good example of the revitalization and rebranding of the town," said Nelson. "We have various groups in town working together, artists and students collaborating and it encourages visitors to spend more time downtown." Kim McKinney depicting the arts community. The projects first 6 boats are placed centrally downtown and over the next 2 years, 18 will be in place. 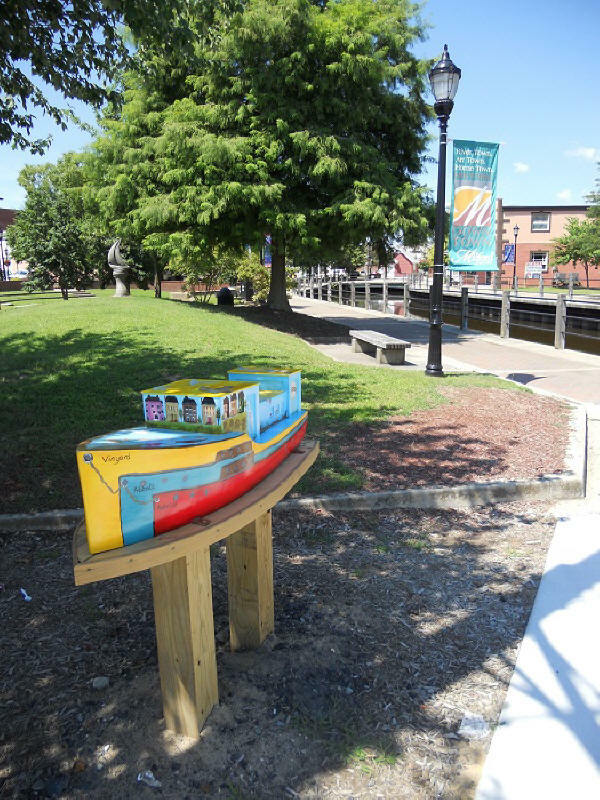 Local artists are juried in and mentor a local high school student to decorate the boats based on the town's branding of River Town, Art Town, Home Town.・ DMI produced a brochure explaining the artist's design for each boat and showing their locations. Cambridge, MD in Dorchester County has a number of murals and mosiacs in town. They have just dedicated a new series of murals in honor of James Michener's Chesapeake. They highlight the area's natural heritage, both done by local mural artist, Michael Rosato. 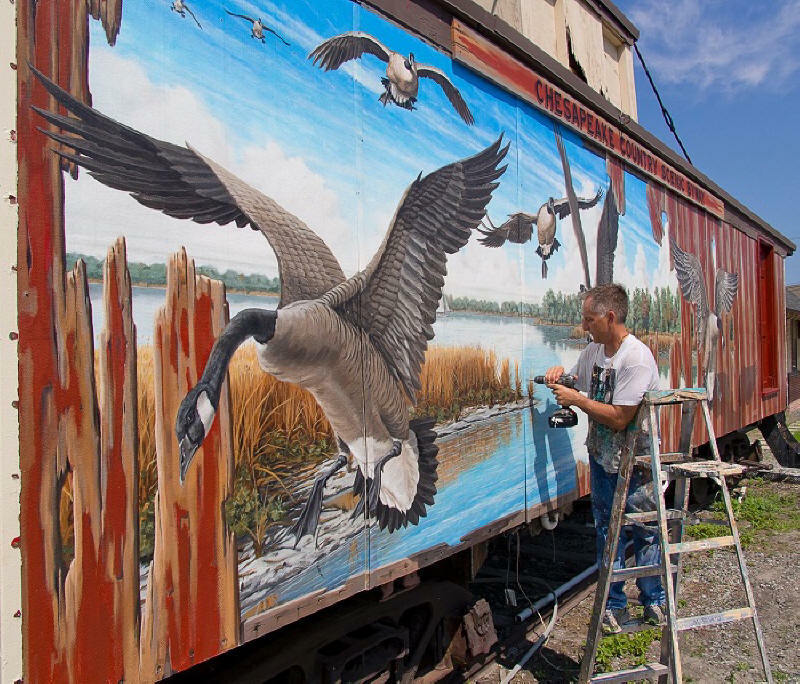 One is on a train caboose on Maryland Avenue in Cambridge and features Canada geese. The second on the side of J. M. Clayton Seafood, overlooking Cambridge Creek, portrays The Watermen, a great blue heron,. 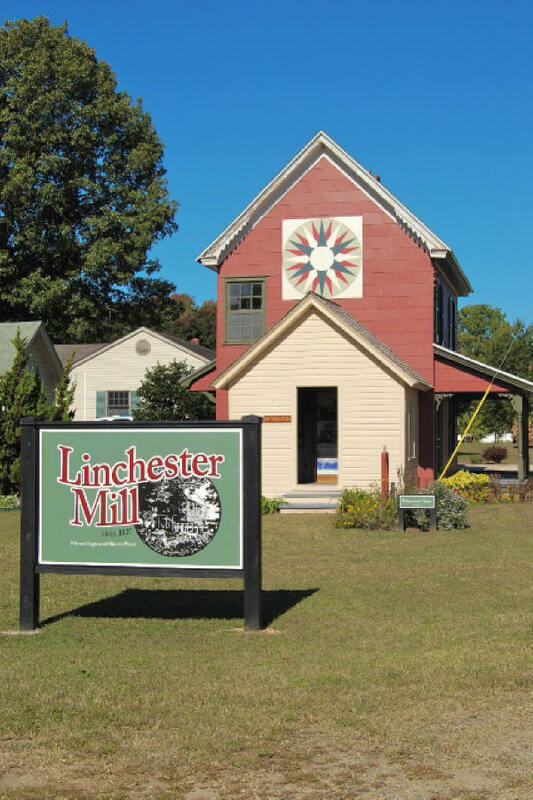 "Dorchester's rich history, unique Chesapeake culture and expansive landscapes are known by people around the world thanks in part to Michener's seminal work," said County Tourism Director Amanda Fenstermaker. "These inspiring works of art help tell our many stories to visitors and residents." Down at the beach Ocean City is known as the "white marlin capital." The Ocean City Development Corporation, commissioned a White Marlin sculpture in stainless steel, by eastern shore artist, Paul Lockhart. The marlin joins a long list of public art in many forms - sculptures, wall murals, painted utility boxes, and designed brick pavers in Ocean City. Public art can stir up local pride or fire up controversy, either way it is an exciting addition to any town. Public art encourages visitors to the area helping to create economic development. And, for locals and tourists alike, it is a neat way to study local history and find out more about the area.